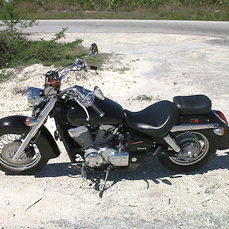 Freeport, Grand Bahama Island - 2004 Honda Shadow Aero 750 cc for sale. Black. Licensed until July 2012 and had a tune up one month ago. In very good condition. Comes with a cover, heavy duty lock, 2 helmets and its own little leader headlight back.